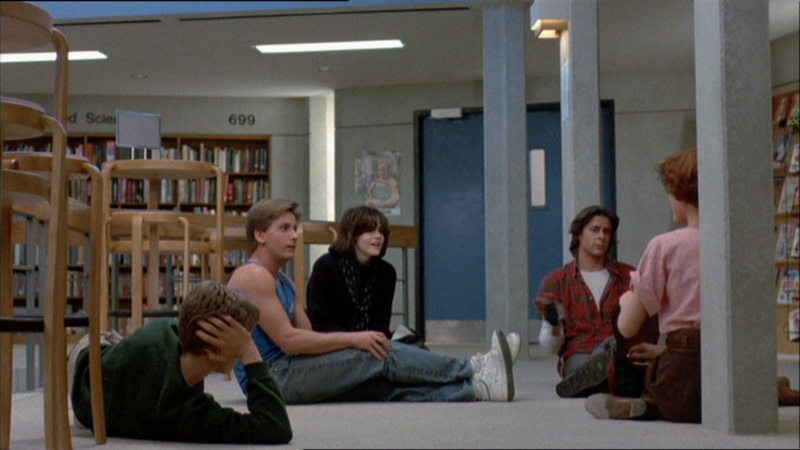 Warning: this post has curiously ended up being about the endings of films, details of which are revealed! This week’s film journal excitingly includes films watched whilst suffering from post-hogmanay celebrations, i.e. A New Year’s Day Hangover. I’m sure readers will have their own favourites or go-to films when under the influence of dehydration and/or nausea and perhaps the consensus would be that a hangover film should be an unchallenging watch, possibly comedy and generally intended to make one feel better. My choices this new-year were, in order: Point Break (Kathryn Bigelow, 1991), The Breakfast Club (John Hughes, 1985) and Gran Torino (Clint Eastwood, 2008). Until The Hurt Locker, Bigelow’s films always made me feel a little creepy. Strange Days (1995) is an elaborate dustpan take on ‘unmediated’ virtual reality and The Weight of Water (2000) does nothing to promote poetry as a form of seduction. 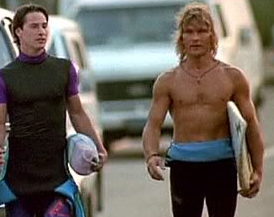 Nevertheless I anticipated good things from Point Break, which has been much celebrated for its action set pieces, including surfing, skydiving and gunfights. Its also been much critiqued and theorised with regards to its treatment of the male body; which appears the object of the fe(male) gaze as stars Keanu Reeves and Patrick Swayze are seen either showing flesh and/or fetishised for the feats of strength and agility that their toned bodies are capable of (books about this can be found here and here). 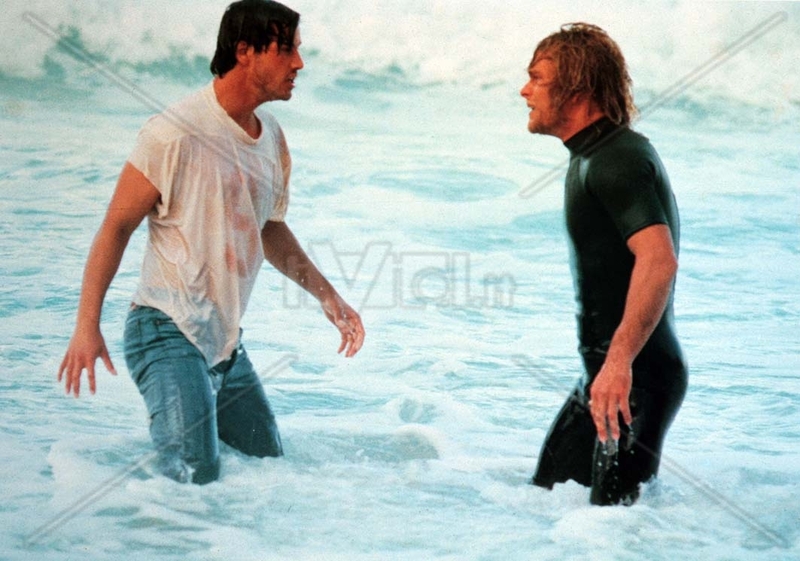 Point Break is less of a cop buddy movie – though Reeves does have a cop buddy in the form of Gary Busey – and is more that classic love story between the officer of the Law (Reeves) and the criminal he hunts (Swayze). My perspective on seeing the film was therefore clouded by preconceptions such as those mentioned above; but what surprised me (aside from just how awesome the action is) was that I didn’t believe the decisions that Reeves character makes. Such is his respect and awe for Swayze’s surfing Zen master, he puts aside justifiable anger at his girlfriends kidnapping and torture (not to mention the death of several people) and gives his blond beauty what he wants: a glorious death rather than a humbling imprisonment. True love I suppose and though not plausible considering the lengths gone to catch him, a more spectacular ending. Gran Torino also came loaded with expectations and contained lots of drawn out repetitive scenes involving Mr Eastwoods’ parody of his own classic Dirty Harry persona. It’s really quite convenient that his character talks to himself; otherwise one would be robbed of many witty asides about how he hates everyone. 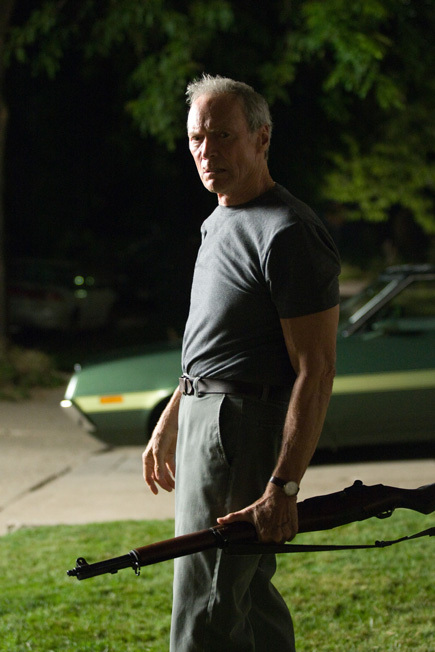 Ultimately I thought Gran Torino dragged out its set-up and was simply too long. At the cinema, Life of Pi directed by Ang Lee was thrilling and spectacular, proving that some films do benefit from the third dimension. Adapted from the book of the same name by Yann Martel, its framed as a conversation between Pi Patel (Irrfan Khan) and a writer i.e. Martel (Rafe Spall) as the former tells the amazing story of how he survived a shipwreck alongside a Bengal tiger called Richard Parker. Early on in Pi’s story, we see his father warn his two sons not to be fooled by religion, as its all ‘spectacle’. The adventure includes glowing jellyfish and a whale breaching over the lifeboat, a carnivorous island and of course, living alongside a dangerous predator – spectacle – it could be argued, is the film; as suspension of disbelief allows one to be caught up in Pi’s incredible quest. This makes for a very enjoyable cinematic experience, particularly the seamless way in which live action is blended with CG. The final part of Pi’s account is that of relating the story to the Japanese Transport Ministers whilst recovering from his ordeal. Not believing him, he tells a different version of events that is more believable and less fantastic. What is problematic is the simplistic way that Pi’s story is related back to his faith. Having heard both accounts of his survival, the writer is asked; “which do you prefer?” to which he responds; “the one with the animals, it’s a better story” eliciting the reply from Pi; “And so it goes with God”. The ‘better’ story is one that allows for belief in the incredible without reliance on facts or logic – in other words, pure faith. To be a cynic, or atheist is to lack imagination – to reject spectacle – as Pi’s father did. This is a particularly banal and reductive way to understand faith carried over from the book and one that is disarming, if – like me – you’re an atheist who’s just allowed the preceding adventure to entertain and amuse you. 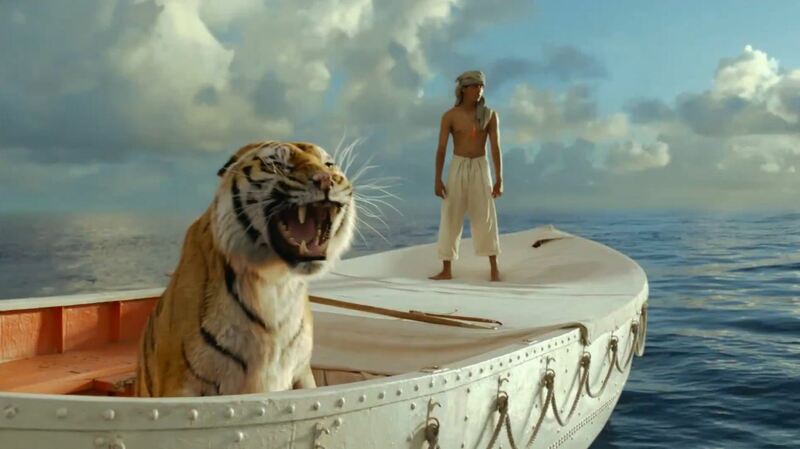 Life of Pi is perhaps best thought of as a wildly successful exercise in suspending disbelief, whilst affirming faith in that fantastic thing: cinema. The Lady Vanishes, Alfred Hitchcock. Up, Pete Docter, Bob Peterson.